Using realia to teach English. 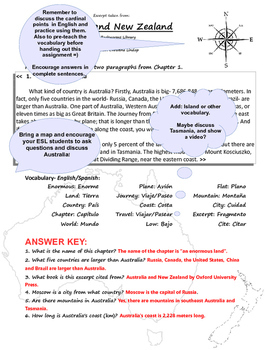 Read a real article about Australia and New Zealand and answer reading comprehension questions. Discuss cardinal directions. Learn vocabulary focused on travel and geography. *Some literary vocabulary included (cite, chapter...) Use this handout to get your students thinking about other countries, cultures and asking questions in English! This activity easily took up an hour of class time for my ESL groups. Do not purchase this worksheet if you have purchased the "Make A Postcard With Your ESL Students" Lesson Plan, as it is included.